Tired of looking so hard? Frustrated by inaccurate information? Give yourself a head start with the industry’s leading one-stop-shop for prospect development. iWave brings you wealth and philanthropic information on prospects and donors so you can quickly determine do they have a history of giving, do they love your cause, and how much do they have to give. With iWave, you’ll know who to ask, how much to ask for, and when to ask. For more information on each of iWave’s datasets, click here. A fresh approach to wealth screening. Use iWave Screening to uncover top potential donors that are inclined and have the capacity to give to your organization. It’s built on a foundation of customization and transparency that puts you, the expert, in control. Get a view of a segment or all of your databases that highlights which prospects warrant deeper research. Rate a donor’s propensity, affinity, capacity, and overall potential to give to your organization. Customize numerous parameters so you can have confidence in the results. Get a starting point and then the tools to validate, add and delete records, and refresh scores. Export a list of scores to evaluate, compare, and upload into your donor management system (DMS). It’s the smarter prospect scoring system. The iWave Score gives you deeper insight into your prospect’s propensity, affinity, and capacity to give. In other words, how philanthropic are they? How much do they love your cause? How much do they have to give? Prioritize a list of prospects based on their inclination, affinity, and capacity to give. Customize the weighting of the aspects that make up the iWave Score for stronger confidence that it aligns with your fundraising strategy. Customize the capacity ranges for synchronization with your target prospects. Building Prospect Profiles is easier than ever before. With iWave’s automated Profile builder you can build a prospect identification profile in seconds. Starting at step 1, you have the ability to choose which records to include in the iWave Profile, giving you the confidence that the records and Profiles are accurate. With every iWave Profile comes an iWave Score so with complete transparency you can see your prospect’s propensity, affinity, and capacity to give to your organization. Not only can you save your iWave Profiles for quick access, but you can also enable automatic alerts to notify you of your donor’s wealth-creating events. Easily share iWave Profiles with other team members allowing them to update and maintain the Profile with you. And don’t waste time piecing together a report, Profiles are formatted for easy printing with just one click. iWave users can create a batch of profiles using only a name, city, and state or province. Up to 50 individuals can be uploaded per batch and you can export a list of results to evaluate, compare, and upload into a DMS. Receive a propensity, affinity, and baseline capacity rating for each prospect, all of which will be used to give you an overall iWave Score. Customize the iWave Profile, ratings, and scores to meet your organization’s needs. Download a list of prospect ratings/scores so you can evaluate, compare, and upload into your donor management system. View the records that make up the iWave Profile and scores, add and delete records, and refresh scores as you verify. iWave is the industry’s top-rated tool for integrated search. Users can search a single name across all of iWave’s industry-leading data providers with just one click. 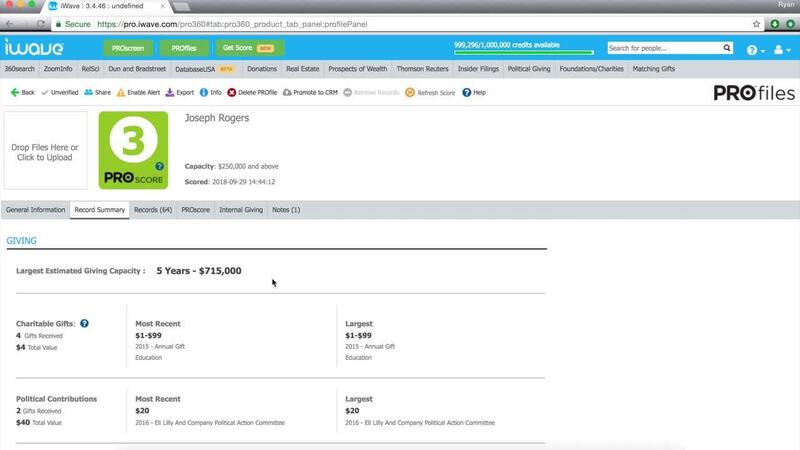 View your donor’s propensity, affinity, and estimated capacity ratings without leaving your donor management system (DMS). iWave currently integrates with Salesforce and Tessitura CRM, but there are more DMS integrations on the way! Access valuable donor insights faster and more efficiently. Enrich your donor database with iWave’s 1 billion wealth and philanthropic records. Uncover prospective donors with capacity and inclination to give that are hidden in your database.